Infested Mine is a medium-sized mine north of Kvatch containing marauders. It contains three zones: Infested Mine, Infested Mine Old Works, and Infested Mine Spent Galleries. This mine contains 9 Cairn Bolete plants and 12 Wisp Stalk plants. There are two chests outside the mine on the rocks above. One is right next to the waterfall. A few steps west of the first, a dead goblin is lying on the second chest holding a beer bottle. This location's map marker (M on map) is named Infested Mine (editor name InfestedMineMapMarker). The entrance door is N of the marker, 40 feet away. 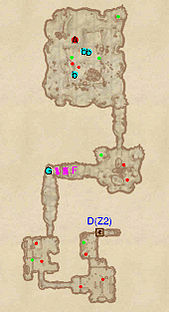 Infested Mine has some minor features both inside and outside that distinguish it from other dungeons of its type. 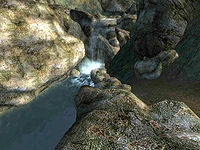 Firstly, the mine's doorway is located behind a small waterfall that flows into a small lake just outside. Above the mine are a couple of chests, including a boss chest (marked B on map). On the boss chest is one of the many dead, drunken goblins in the game. The last zone, Infested Mine Spent Galleries, contains the only Empty Hist Bottle found outside the Blackwood Company headquarters in Leyawiin. In addition, this is the only mine that contains marauders as enemies. 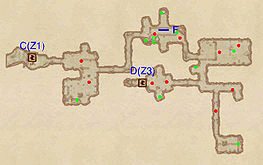 The first zone in the mine consists entirely of one small room containing one enemy, one chest, and the door to Infested Mine Old Works (C on map). The enemy spawns right in front of the doorway, nearly guaranteeing a fight to occur, so be careful upon entering. Infested Mine Old Works, while mostly linear, contains a good deal of enemies and loot. Navigate through the various cavern rooms and halls until you a small intersection. Taking the right turn at the intersection leads to the door to Infested Mine Spent Galleries; going left will have you end up in the small southernmost room in this dungeon section. The second room in this area has a basket containing three silver nuggets, a vein of silver, and some pickaxes clustered at E, indicating the mine is still actively being mined. Also in this room are loose planks at F on map that, if pushed, will reveal a small area off of this room that has one chest. This zone can be particularly tricky for stealth characters; the area is extremely bright, and the enemies are located close enough to each other that altering one enemy will generally alert others nearby. So be careful with how you sneak through here. 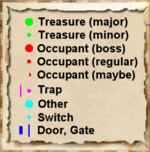 The corridor before the third room in this section has a dead treasure hunter (G) and several swinging maces at F (which are activated by the pressure plates in front of them at locations E on map). Meanwhile, the last chamber in this zone has the boss marauder at A and the empty bottle of Hist sap mentioned previously on this page, as well three of this zone's chests.